Having a vacation home will give us a place where we can rest and unwind. We will also be able to de-stress away from the busy city. A vacation home is something that most of us dream to have. Others would merely visit a relative who lives in a place away from the busy life or would really spend a vacation on a relaxing and beautiful place. 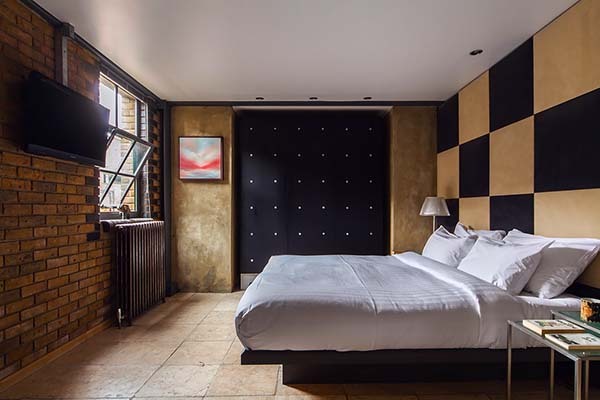 Today, we are going to show you a vacation home in the UK. 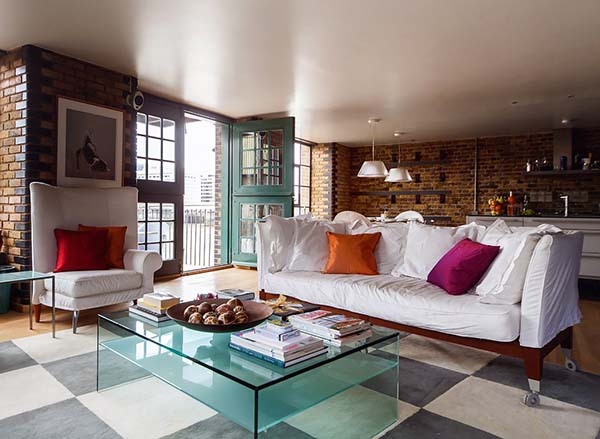 Clink Wharf is a gorgeous vacation home with open plan living located in London Bridge, South-East London, London, England, United Kingdom. A little trivia about the home, the building was once a pineapple warehouse and its historical features are preserved in the house. The house has white linen sofa in a living area that is visually separated from the rest of the areas by a checkerboard rug. 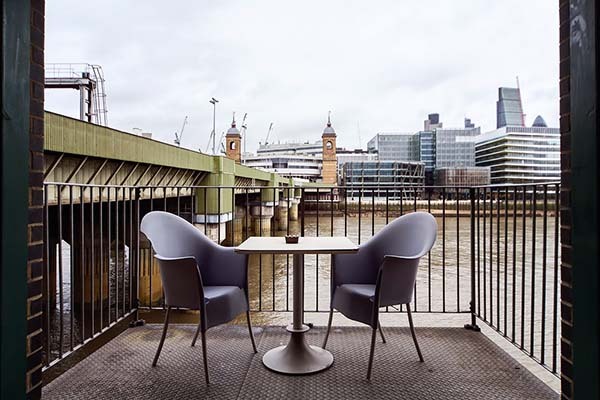 Double doors lead out to a cozy balcony with views over the Thames River. 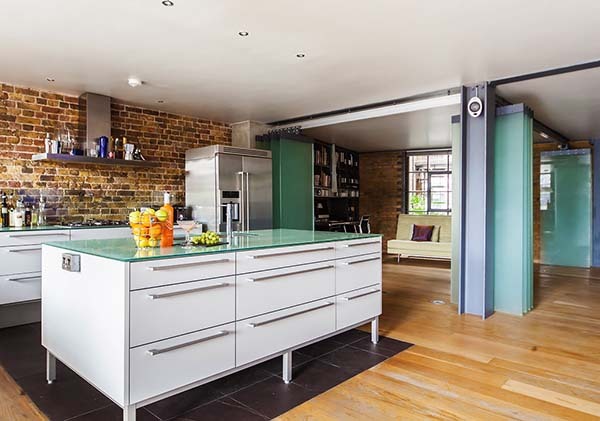 The kitchen is open and airy with a spacious island. 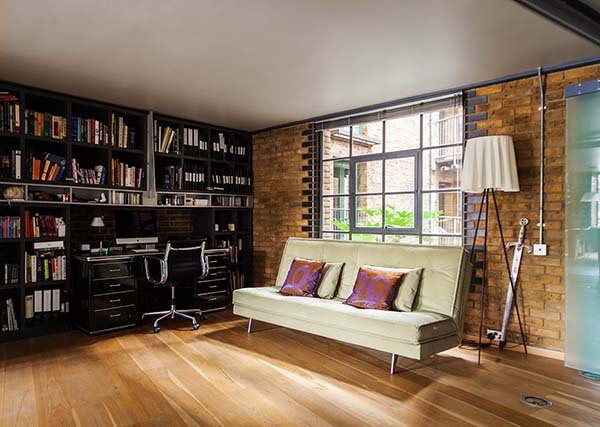 An office space is also seen in the house with book-lined shelves and a sofa bed. The fabulous vacation home has two bedrooms wherein one has an en-suite bathroom. Come take a look at the house. The white couch sits on a checkered area rug in this lovely living area. 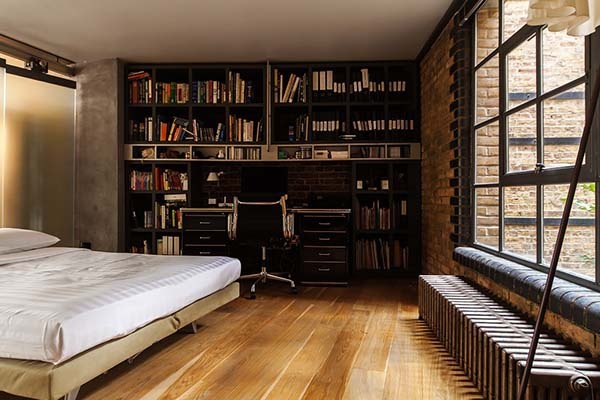 Note the use of wood for the flooring and bricks for the walls. 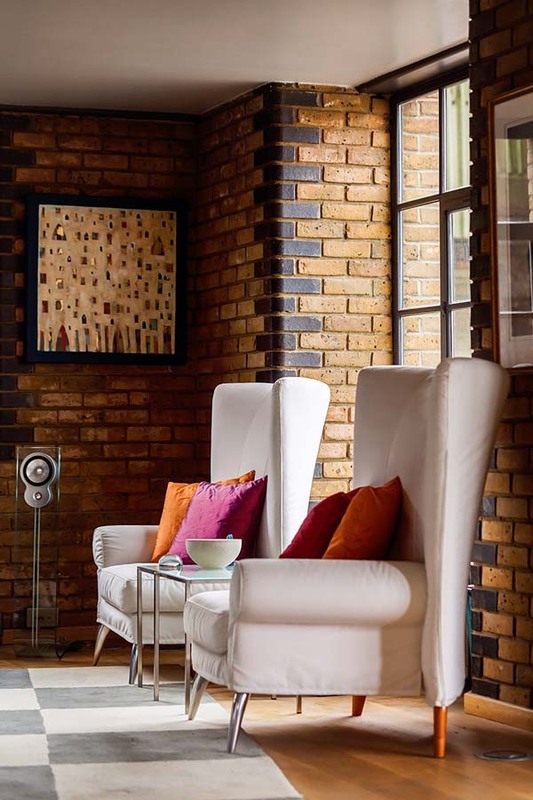 The interior is both pleasing and artistic as it brings in fashionable furniture. A balcony is seen just off the living room that gives a view of the river. Seen here is the dining area with white chairs and wooden dining table. 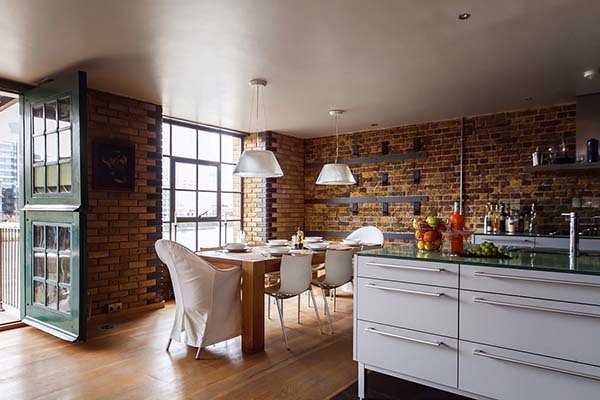 The same brick walls are seen here as well as white island for the kitchen. 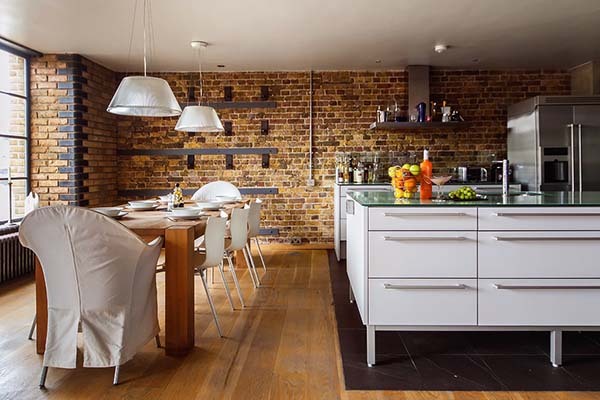 A glass topped island is use for the kitchen that looks very modern. A working area is inserted in this space with built-in book shelves. This is actually part of the bedroom with a bench near the windows. This is the interesting feature of the house. It used rotating glass to add privacy to the bedroom. 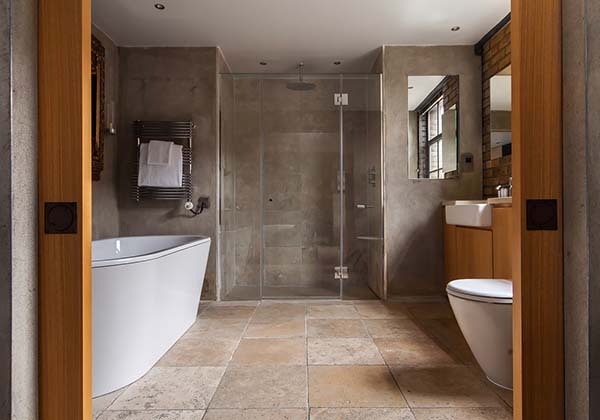 The bathroom has a contemporary look with modern bathroom fixtures. 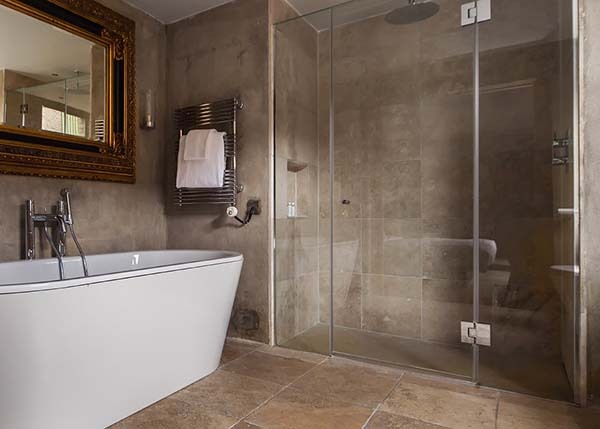 The shower area is enclosed in glass adding some transparent feature in this bathroom. The bedroom looks awesome and has that subtle masculine feel in it. 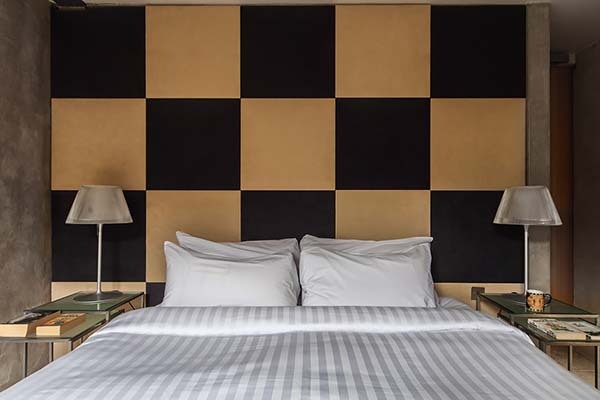 The headboard of checkered gold and black give this bedroom a unique personality. 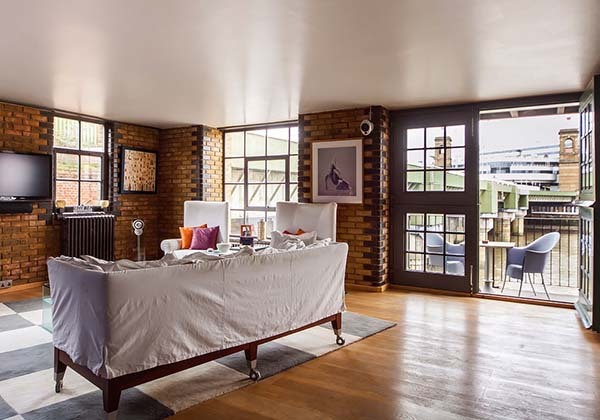 Clink Wharf is indeed a vacation home that we would all want to visit! I love its contemporary design with some historical features that were preserved from the original structure. I also like the way the interior was designed and how natural light floods into the spaces. This is indeed a stunning vacation home. Do you agree?